Photobucket must have stopped working again. I fixed this as well. No, Allan, stupid me changed the directory name after I had posted the pictures. LOL, I do that all the time, and then I wonder why my photos don't work. Those photos make it look like the city goes on forever. what are the purposes of the 3 white buildings in the bottom left hand corner? I have some Paris pictures floating around. I'll have to scan them when I get the chance. I believe that they are government buildings. I studied French in my earlier years in high school and learned what the 'boxy' building is. I will find out for sure though. go ahead and post them- people here might be able to tell you. Here's some of my Paris photos. I have some more kicking around somewhere and will scan them if any look worth sharing. These are from the summer of 1990.
lyon seems like it would be a better place to visit than paris? Lyon is stunning, I only spent an afternoon there, I wish I had had more time. Paris without a doubt is more lively and has more to do (I spent 3 days in Paris). If I ever get to go back to France however, I'll probably skip Paris and head south. But a lot of that is just me, I'm not that impressed with big cities, I like the smaller, less visited ones. I have yet to go to France, but hopefully one day. Lyon looks amazing. How many people live there? I think it's France's second city, it has a subway. When I was there the streets were packed. emporis ranks it as their 3rd population wise. i havent even heard of Lyon, yet i thot Moscow was crowded(well.. 2 or 3 million- meh- we have alot of land)! I love this picture! Where the heck was this taken from? It must be from the air, because I dont remember any tall buildings being in the vacinity. I'm going to Paris in March, and I'll be sure to visit La Defense again and see whats new. 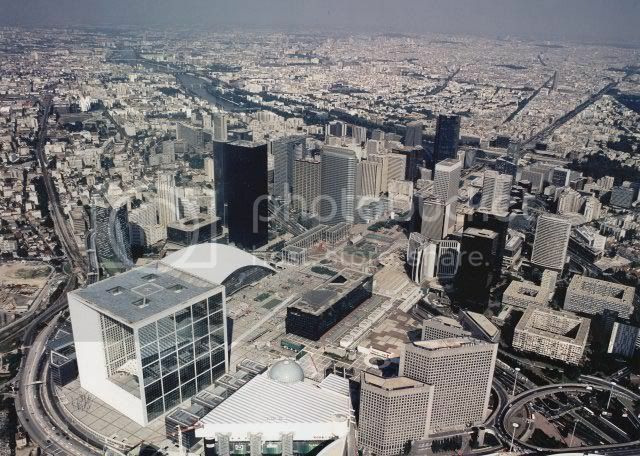 That square builiding in the lower left is know as La Grande Arche. I'm not sure what gov't agencies are located there, but when you look at La Defence from the top of L'arc de Triomphe, La Grande Arche lines up perfectly in the distance, its quite stunning. this picture I took back in 2000. the lighting was kind of bad that day, but you can see in the distance The giant box of La Grande Arche. This was taken from L'Arc de Triomphe. I posted my pics before Photobucket ate my files. I'll repost them when I get a chance, I forgot I had posted photos here. One more Pick I found from 2000. I love this structure. A good example where height is not always a bad thing!